It was about a year ago when the web buzzed about Rock Band 3 and it’s ability to finally allow gamers a way to learn how to play guitar and bass. However, it’s innovative buzz came and went. I hardly ever see a pro player on multiplayer these days. Instead, the uniqueness of the game was lost and all that remained was a new installment into the Rock Band franchise. As innovative as it was, it just seemed like a faint whisper to me. So, of course, when Ubisoft announced Rocksmith at E3; I was skeptical. It’s only natural. It felt like de ja vu. Been there, was a little bit disappointed with that. What does Rocksmith have that the other game I mentioned a few sentences prior didn’t have? I had to find out for myself. However, after playing Rocksmith, it’s important that I make this disclaimer. From this point on, I won’t refer to that other game, *cough Rock Band cough*, simply because they are two different genres and it’s not fair to place them into the same category. Simply continue reading on to find out why! In case you aren’t familiar with Rocksmith, allow me the chance to briefly explain a little further. I think I put a few hints but it’s only right to dig a little deeper. Rocksmith is a music game that comes bundled with a special cable which allows any guitar with a standard ¼ inch jack to be used as the game’s controller. As you play through the game, Rocksmith instinctively determines your skill level and creates an experience unique to player. Initially, the game starts off on easy and gradually increases the difficulty the better you play. Rocksmith falls into the educational category for me. The focus isn’t placed on multiplayer or leaderboards. The heart of the game lies in trying to make you learn how to play a guitar while trying to limit the amount of frustration you might usually encounter when trying to learn how to play an instrument. Traditionally, learning how to play an instrument meant pulling out cash to pay for an instructor for hours of practice. 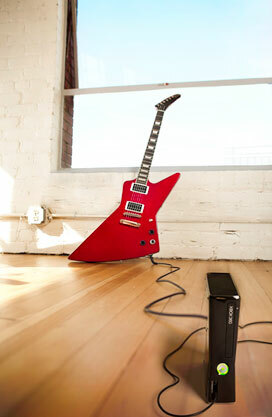 With Rocksmith, you leave the instructor behind! For the cost of either the game or bundle pack, you’ll be seeing yourself playing an actual guitar in mere minutes! What excites really me about Rocksmith, is it’s simplicity. It’s amazing how easy it was to pick up a guitar, select a song and just play. The game is so awesome that during your initial play through the game automatically begins on easy and the difficulty subtly increases the better you play. In my case, I had the luck to play after someone who was at a higher difficulty than me and the game knew that I wasn’t able to handle it and lowered the difficulty till I was comfortable again. The subtlety of the difficulty changes is what made me fall in love with Rocksmith. While in other rhythm games, Dance Dance Revolution included, I would think I was ready to take on the harder difficulties simply because I was able to do fairly well on a few songs. Disillusioned with my glimmer of awesomeness I would up the difficulty. Then abruptly turn off the Xbox. There was no middle ground. There’s just Expert and everything else. Nothing was able to keep me motivated to keep trying. Frustration was all that hid around the corner. This frustration was slightly unnoticeable with Rocksmith. But don’t think everything was just perfect. Nothing’s ever perfect. The menus were clunky. Between Harley Q and me, it took us a while to figure out where exactly we could select a new song to play. Plus, since I don’t play the guitar, all the fancy options for setting up the amp are lost on me. I’m hoping there’s some mode that I overlooked that digs in a little deeper on what all these amp settings do. It’s clear that from the novice to the professional guitar player, the game is easily acessible to anyone with a guitar handy. All in all, Rocksmith is officially in my pre-order queue. Hopefully, I won’t keep my neighbors awake with my practicing.